The management of aortoiliac occlusive disease has, for the most part, transitioned to an endovascular-first approach, irrespective of TransAtlantic Inter-Society Consensus (TASC) classification, with open surgery primarily reserved for recalcitrant disease or technical failures in recanalizations. Although open surgery affords good long-term patency, it does so at the cost of significant perioperative morbidity. It has been published on many occasions that TASC C and D lesions treated by endovascular means have comparable results to classic open surgery.1 This has led to changes in intersocietal recommendations, which now call for endovascular treatment as the primary therapeutic approach for both focal and advanced aortoiliac disease. 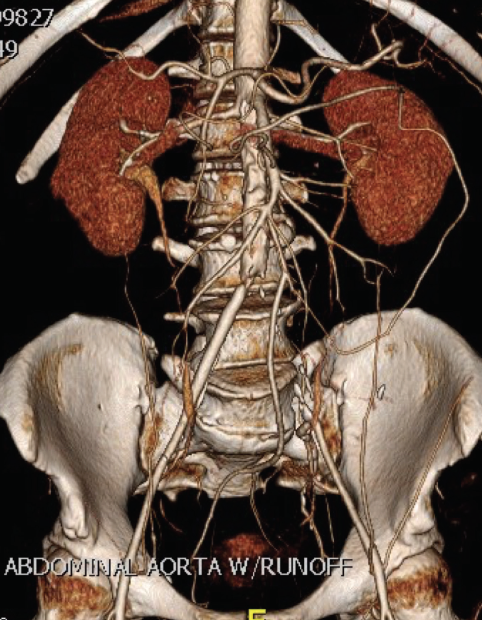 Nevertheless, as with all endovascular therapy, there are both highlights and challenges to this approach (see the Pearls and Pitfalls of Aortoiliac Disease Management sidebar). This article aims to provide personal opinions and relevant data from clinical trials and cases regarding the challenges of aortoiliac disease intervention and management. When considering aortoiliac disease, it is important to ensure that imaging is as informative as possible, which generally means obtaining a CTA (Figure 1). A good-quality CTA of the abdomen and pelvis allows you to assess inflow and outflow. It is imperative to assess the infrarenal aorta and its bifurcation for flow-limiting disease, each segment of the iliac arteries, and the femoral artery and its bifurcation (Figure 2). When considering endovascular interventions of the iliac arteries, other variables to glean from the imaging are the extent of calcification, presence of thrombus, potential risk of rupture, vessel sizing, presence of an abdominal aortic aneurysm, and need for a hybrid procedure. Another crucial consideration is the extent of iliac disease into both the aorta and the femoral arteries. Leaving either one inadequately treated has the potential to influence outcome, the first due to inflow and the latter to outflow. Figure 1. Clinical history of a patient with left leg pain when walking short distances. A CT image showing left CIA occlusion with stenosis of the right CIA. The ankle-brachial index (ABI) was 0.8 on the right and 0.4 on the left. Patient had no pulses on left leg and weak pulses on the right. Figure 2. Baseline arteriogram showing the aortic bifurcation with left CIA occlusion and right CIA stenosis. What dictates patency rates and freedom from target lesion revascularization (TLR)? The answer is likely multifactorial. Calcification, lesion length, tortuosity, appropriate sizing, outflow, and inflow should all be considered, but the device also matters. Outside of focal disease, overall results are generally better with primary stenting over simple balloon angioplasty. This is even more apparent in the case of heavily calcified vessels. In the choice of devices, basic decisions must be made between a balloon-expandable or a self-expanding stent (SES) and then whether the stent should be covered or uncovered. Outside of some anatomic restrictions, there are not any absolutes. However, each stent has its role. For example, if a vessel is calcified, a balloon-expandable stent with more radial force is likely to yield an optimal result. By all indications, most recent data suggest that covered stents afford better patency rates and freedom from TLR than uncovered stents.3 The COBEST trial found that covered stents fared better in the short and long term, particularly for TASC C and D lesions.4 Overall, using covered balloon-expandable stents significantly diminished the need for TLR. Based on the results from the COBEST trial, the Society for Vascular Surgery guidelines support covered stents for TASC C and D lesions.3 This may also be in part due to the potential safety advantage of a covered stent in the case of rupture. As a word of caution, although covered stents provide a certain degree of protection from ruptures, they should not give the interventionalist the notion of absolute safeguard. In fact, bleeding can occur in highly calcified vessels behind a covered stent and may not be immediately discernible on angiography. Another important and more recent study provided additional evidence that covered balloon-expandable stents offer distinct patency advantages. The VBX-FLEX study, first published in 2017, provided data most closely approximating real-world results.5 The study had very few anatomic exclusions, and with 42.5% kissing stents, stenting of external iliac arteries (EIAs), and no exclusions for occlusions, it still managed to provide an overall 9-month per-lesion primary patency rate of 96.9%. Interestingly, results seen in TASC C and D lesions compared favorably with those in TASC A and B lesions (primary patency was 95.3% for TASC C and D vs 97.4% for TASC A and B). In light of the presented data, my algorithm is geared toward primarily using covered balloon-expandable stents. Figure 3. Arteriogram after stent placement at the aortic bifurcation (A). Arteriogram close-up showing the preservation of the aortic bifurcation and iliac bifurcation with accurate stent placement (B). ABIs after the procedure showing normalization of the arterial circulation (C). When approaching aortoiliac disease, I immediately try to discern whether the disease extends into the aorta, and if so, how far. This assessment must also consider the condition of the common femoral artery (CFA) and whether there is a concomitant aortic aneurysm. I have a fairly liberal approach to hybrid procedures, so I do not hesitate to endarterectomize the CFA and its bifurcation. Similarly, I decide early on whether kissing stents will suffice (Figure 3). As frequently as possible, I try to avoid extending into the aorta to preserve future opportunities to cross over the iliac bifurcation. If there is sufficient aortic disease to warrant treatment, then one must decide how far into the aorta the kissing stents must extend or whether a more advanced intervention is indicated. There are those who advocate simply extending kissing stents as proximal as necessary. I opt for more advanced management of the aortic disease with a covered endovascular reconstruction of the aortic bifurcation (CERAB) technique for lengthy aortic disease.6 I generally reserve the CERAB technique for advanced disease (eg, TASC C and D lesions). As far as stent sizing in kissing stents, remember that it is important that the stents are appropriately sized to the aorta (Table 1). I always use balloon-expandable stents, which are sized to the common iliac arteries. I then postdilate with short (20 mm X 2 cm) semicompliant balloons, as necessary, so that I can flare the aortic segment and appropriately expand to the lateral edges of the aortic wall for optimal wall apposition. The drawback to SESs in kissing stents is that there is no option to flare the stents. Although it is optimal to only oversize an SES by a maximum of 20%, when sizing to the common iliac artery (CIA) one may not be able to ensure suitable sizing in the aorta. If not, I opt for more advanced management of the aortic disease with a CERAB technique.6 If an aortic aneurysm is present, device usage must be carefully considered. If a future endovascular aneurysm repair may be needed, a balloon-expandable stent is preferred, as this will allow further ballooning in cases where access is an issue. A covered balloon-expandable stent is advised, as this controls potential ruptures. Focusing on the iliac stenting alone, I have slightly transitioned my paradigm over the years, although primary stenting is the mainstay. To a great extent, this evolution is based on the best available evidence and patient characteristics. Anecdotally, it is my impression that, over the years, I have managed more and more patients with heavily calcific disease. This fact, coupled with experiences with iliac ruptures in uncovered stents, has driven me to primarily use covered stents. My only exception to using covered stents is across the iliac bifurcation. Here, I continue to use uncovered stents to maintain some flow to the internal, at least acutely. It is imperative to not shy away from treating this segment. Many interventionalists avoid this area by treating proximal and distal to the bifurcation, and this is often the root of treatment failure. Another source of debate is management of the EIA. Most will opt to treat the EIAs with SESs, most likely due to the potential proximity to the inguinal ligament and the significant longitudinal compression that happens in this EIA. I recommend choosing a stent that tolerates motion well. The VBX-FLEX study showed similar results in the EIA and CIA,5 likely a consequence of the independent stent structure of the Viabahn VBX balloon-expandable endoprosthesis (Gore & Associates). Thus, my preference is usually a combination of the Viabahn self-expanding endoprosthesis (Gore & Associates) at the inguinal ligament and the Viabahn VBX proximal to this. 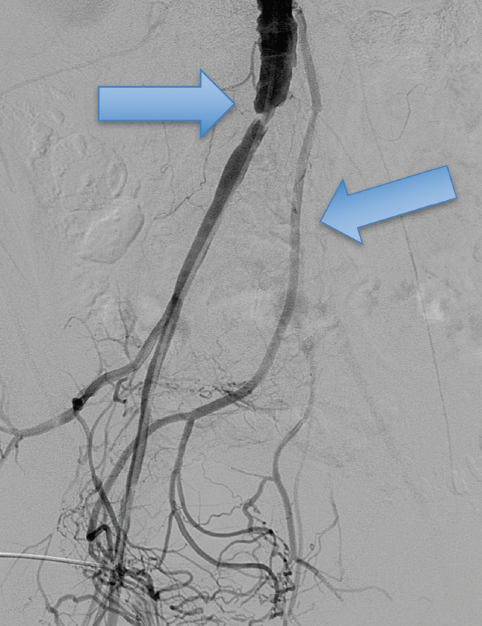 With the confidence we place in today’s devices and the improved skills acquired by interventionalists, the bottom line is that, even for TASC C and D lesions, it is clear that an endovascular approach should be considered first-line therapy, with open surgery being considered for recalcitrant disease or endovascular failures. Still, it is vital to remember that all devices are not created equal. It is important to use stents with iliac indications, and in order to best serve our patients, it behooves all users to understand not only the design characteristics but, more importantly, the limitations of devices. 1. Leville CD, Kashyap VS, Clair DG, et al. Endovascular management of iliac artery occlusions: extending treatment to TransAtlantic Inter-Society Consensus class C and D patients. J Vasc Surg. 2006;43:32-39. 2. Ko YG, Shin S, Kim KJ, et al. Efficacy of stent-supported subintimal angioplasty in the treatment of long iliac artery occlusions. J Vasc Surg. 2011;54:116-122. 3. Society for Vascular Surgery Lower Extremity Guidelines Writing Group, Conte MS, Pomposelli FB, et al. Society for Vascular Surgery practice guidelines for atherosclerotic occlusive disease of the lower extremities: management of asymptomatic disease and claudication. J Vasc Surg. 2015;61:2S-41S. 4. Mwipatayi BP, Thomas S, Wong J, et al. A comparison of covered vs bare expandable stents for the treatment of aortoiliac occlusive disease. J Vasc Surg. 2011;54:1561-1570. 5. Bismuth J, Gray BH, Holden A, et al. Pivotal study of a next-generation balloon-expandable stent-graft for treatment of iliac occlusive disease. J Endovasc Ther. 2017;24:629-637. 6. Taeymans K, Groot Jebbink E, Holewijn S, et al. Three-year outcome of the covered endovascular reconstruction of the aortic bifurcation technique for aortoiliac occlusive disease. J Vasc Surg. 2018;67:1438-1447.